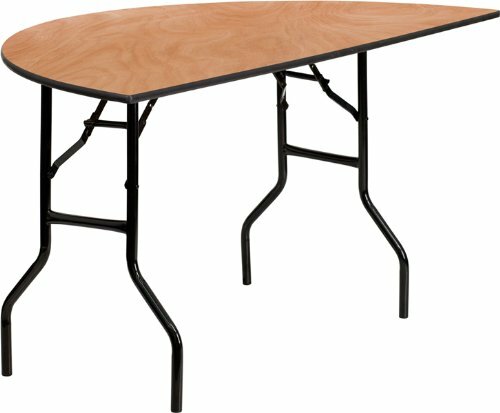 This half round wood folding table is a great option for special event planners, catering companies and banquet facilities.The plywood tabletop is 5' in diameter, half an inch thick, and will comfortably seat up to 5 adults. This durable table features a 551 pound static load capacity. Attractive black powder coated wishbone legs are made from 18 gauge steel, lock securely in place while in use and fold up neatly underneath to transport and store. Protective floor caps protect your floor by sliding smoothly when you need to move it.This durable, easy-to-clean table is commercial rated for use in banquet halls, convention centers and at trade shows.